The best bunch of lads! Thanks guys, you were punctual, efficient, friendly, super patient and accommodating and our boys had a great time using the equipment, that was super clean, well maintained and perfect for kids. And to top it all, the prices are amazing for the amount of equipment you get in the packages. We had 60 kids and there was not one bumped head, scrap or squabble about who was using what! Cheers again guys!! Our Unicorn bouncy castle is especially enjoyed by the girls with a free optional extra built in Bluetooth speaker if required this option can only be used outside if there is no chance of rain. 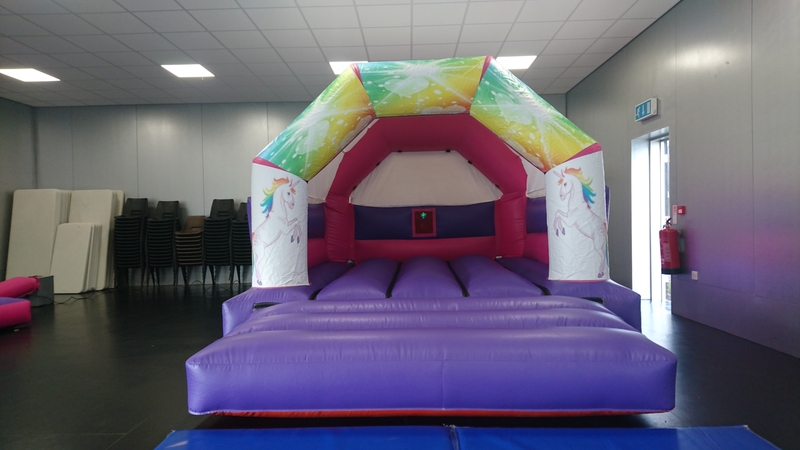 All you need is a Bluetooth device such has ipad, smart phone etc with music on connect to the bouncy castle and play your own music through it the unicorn bouncy castle is only 8ft 6 tall so perfect for venues with low ceiling height. This inflatable castle can be hired from just £55 per day/hire.